There has to be some psychogenic implications at work here. Seriously, what drives me (and many like me) to be captivated by these fear-evoking creatures? Perhaps it is a way of emasculating the fears we herald in our heads. By evoking dreadful imagery and horrific imaginings we take control of them...we trivialize their power over us...construe a way for us to understand our own anxieties. Whatever the reason...I am fascinated by this genre and return to it time and time again. I plan on continuing this theme for the next posting. 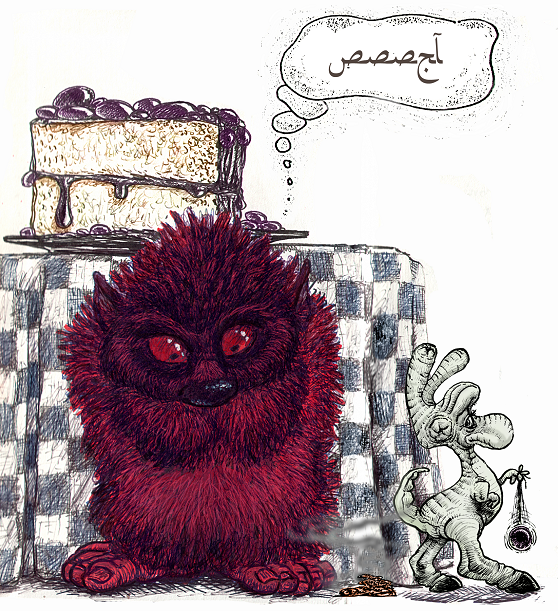 Gateau means "various rich and elaborate cakes". Isn't that what life is all about...adorn and dine...enjoy the varied flavor supposals...motleyed myriads of delicious daubed decor...spread thick...textured insipidity. Snow and sweet baked confections can be easily construed into life's trivial-complexities...our omega-inceptions. Cold and luscious...robust and delicate...easily formed and easily deformed. 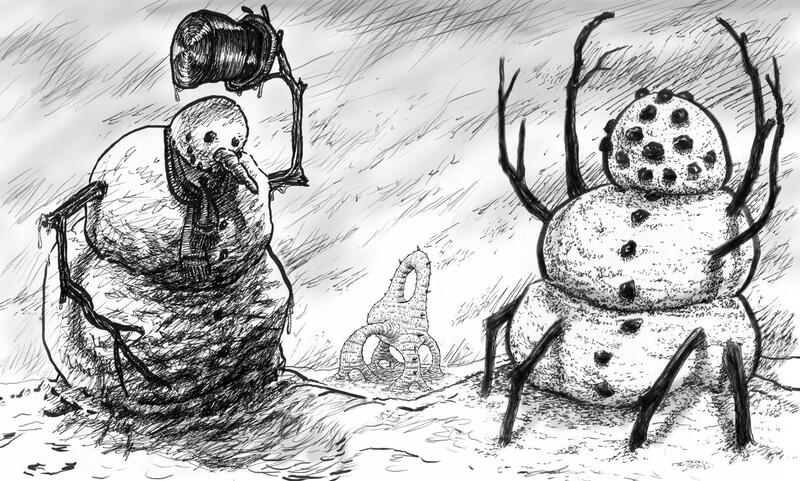 I seem to be compelled or drawn to snowmen. 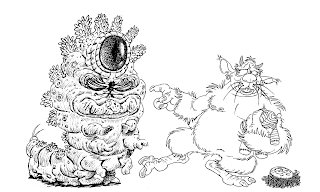 I have been sketching/painting/sculpting them for a long time...perhaps it is their relatively spherical proportions or possibly their gnarled limbs...possibly they have mythical/psychological implications...their naive forms offer up boundless potentiality. For whatever reason they fascinate me and I find them popping up in my art often. 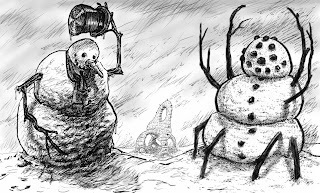 My passion predated seeing Bill Watterson's gloriously illustrated and demented snowmen massacres in Calvin and Hobbes...and those brilliant panels still startle me with their genius...still enrapture me with aesthetic envy...still inspire me...still make me giggle. This composition has been digitally stitched together from 3 separate unrelated sketchbook pages. The dates each were created is a mystery to me, but I conjecture that they are at least 5-7 years old. I can't help thinking of the snowman sliding along in Rudolph's snow milieu or how the electric shaver glides along in the old Norelco commercial...my gentle-snowman locomotes in this world much the fashion, as he interacts with the other spiny inhabitants. Soon I will flesh out these audacious snow critters in Sculpey. They seem to be needing/wanting to be broken out in other dimensions...their festering forms are ready to be unveiled in 3D. I can't wait to have my cake and gleet it too. 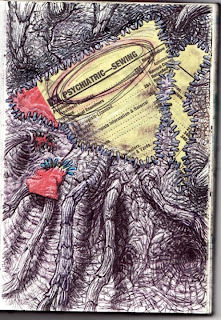 Sketchbooks define me more than any medium; these amassed visions function as a cathartic diary, a conceptual playground, a media laboratory, and an incognizable soliloquy. I obsess...ruminate over each page...each piece is derived individually, but oftentimes one might discern a coherency of style or at least see a concordant series of cosmetic applications amongst the pages. These little experimental clusters began way back in college with an assignment to "fill an entire sketchbook in a semester". My professor was Clarence Morgan, an talented abstract expressionist and brilliant mentor; his extraordinary visionary style and penetrating critiques made an indelible "mark" on me. His classroom challenge entailed putting together over 100 individual pages in a 9" x 12" hardbound sketchbook (set alongside my normal coursework responsibilities)...any medium was game...all pages needed to be "compositionally" consummate. It became a gauntlet I wholeheartedly took up. Little did I realize then, that I would continue on with this challenge for 20 + years...Clarence became a scintillating Johnny Appleseed to me. Here is a random...somewhat more obscure entry. It began with a stochastic rip from a yellow pages heading (a nearly defunct advertising vehicle)...I noticed the weird header and it set my mind to reeling. I grabbed some Elmer's glue and pasted the shredded pieces together. Slowly the oddly serendipitous title pushed out a visual...the contradictory wording conjured up a vision of microscopic stitching...post-hypnotic promptings...mesmerisms with malicious volition...advertisements injected into our psyche just below the threshold of perception...jaundiced stitching onto our method of thought. This is an older piece/peace of mine/mind. It attests to be somewhat of a personal iconic metaphor for me. Now after numerous years of retrospection, I can see the subliminal interrogations ebbing forth...I can now grok the child it was...and has grown into being. Here are my penitent disclosures. Notice the shape...elevated above the plain/plane...it rises up to see the world, the lurking predators. It rises up to stand ready to move, narcissistically proud to be recognized...to not be left behind. Is it stacked and cemented or weathered and eroded from a volcanic ebullition. Really, this rock is a rectangle...an abhorrent geometric contention left to defy the elements. The rock has connotations of the strong religious upbringing I weathered...there is no animosity in that statement...perhaps a healthy dose of cynicism, but no real christian misanthropy. I left that theosophical path behind me numerous years ago, and have grown to realize faith is a subjective mental representation...a make-believe template for behavioral modification. However, the echoing philosophical remnants still emerge at times...those eternal punishments in Hell metaphors shake my inner child at times...weaken my soul-idity...weather my objectiveness. Perhaps this is where the cave comes in. It appears to be a Delphic passage...the mysterious portal to another realm. The enigma lays ahead of us...shall we climb the vines to see? 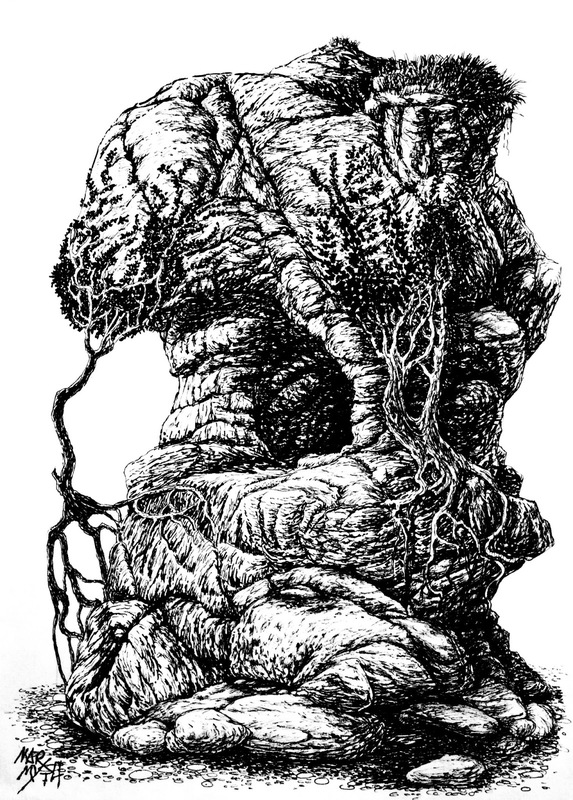 Are these meandering flora the fruitless remnants of knowledge...of life. Why does this withered wellspring call me? Why am I so hypnotized by its beckoning depth? I yearn to feel the dulcet stones, to bear on and cling to their aplomb surfaces...to find my destiny. --I am a Cracker-barrel Surrealist with an affinity for low-brow kitsch... …however all creative endeavors fascinate me. 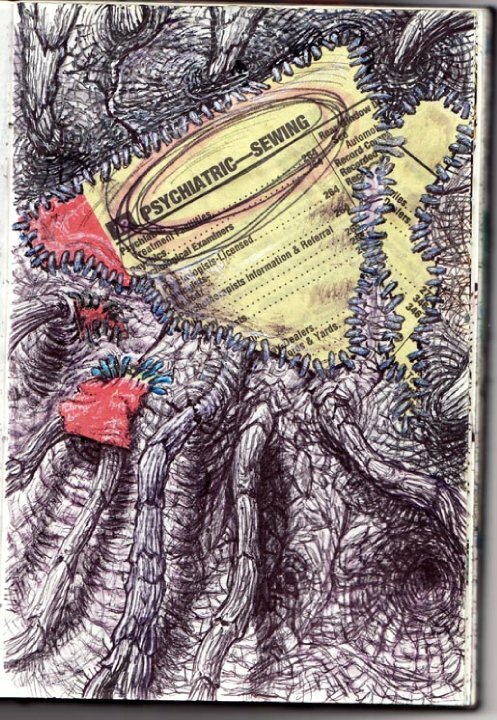 My mainstay is the sketchbook... --I have kept a series of ongoing sketchbooks for years. Each book is flavored with esoteric ideas and pre-production formulations...I indulge myself as often as possible…this obsession has kept my skills honed and my catharsis eternal. --The computer is just another fancy tool …a magically endowed paintbrush that enables me to diversify my illustrative craft...all the same, I still love keeping my hands immersed in paint, Sculpey, or graphite. --Concept art fascinates me most of all…I love the process of conjuring characters from a myriad of possible derivations…this philosophic quest compulsively drives me toward unfamiliar territories…I am a nomadic somnambulist searching for an ever-elusive aesthetic oracle. Marx Myth. Awesome Inc. theme. Powered by Blogger.